There's still time to deliver on the global pledge to eradicate hunger but "urgent measures" are needed to reverse the recent increase in the number of hungry people, speakers at the Committee on World Food Security (CFS) said today. 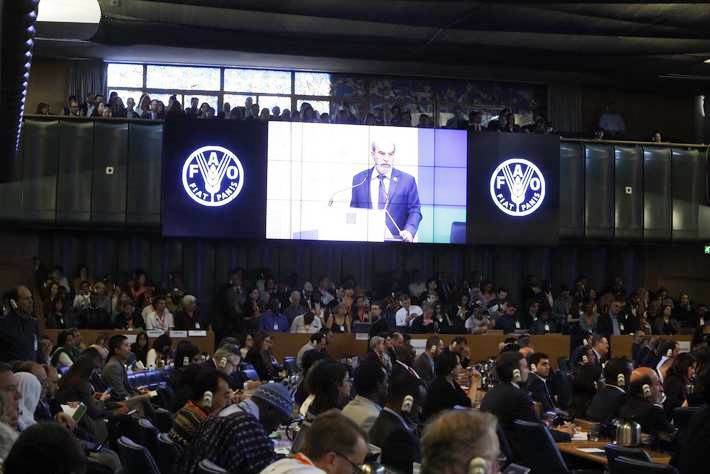 "There is no time to lose," FAO Director-General José Graziano da Silva told the opening assembly of the week-long CFS meeting. Failure to eradicate hunger will undermine all the Sustainable Development Goals, meaning "poverty will not be eradicated, natural resources will continue to degrade, and forced migration will continue to rise," he added. The CFS, open to the civil society, the private sector and other stakeholders, and is the foremost inclusive international and intergovernmental platform for policy coherence and convergence on food security and nutrition. "CFS must step up, lead the discussions, provide guidance, and deliver concrete policies on nutrition," Graziano da Silva said. "Our agenda is extremely ambitious," said CFS Chair Mario Arvelo. "If we are victorious, if every person in every country is sustainably food secure in 2030, that will be the most consequential turning point in history," he added. "We can offer solutions for lifting this shadow that is eclipsing the human condition." This year's CFS sessions cover improving food systems and nutrition, Right to Food guidelines, as well as more than 50 side events focusing on issues ranging from climate change and urbanization to rural women, land tenure, food processing, agroecology and livestock management. Read the full story on the FAO website HERE.